The calling of this general election caught a lot of people by surprise. In many cases it has also made a number of people unhappy. Brenda from Bristol has since gone viral after her cry of “Not another one” was captured by the BBC. Whilst it is too early to tell whether or not the snap election (an election called earlier than expected) will have an impact on the way that voters vote, we can at least consider the question – will they vote? 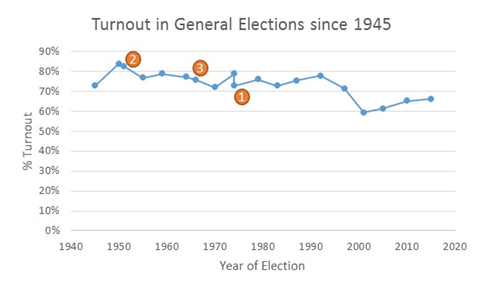 The turnout in UK elections has been decreasing for quite some time. The chart below shows how turnout has fallen from a high of 84% in 1950 to around 66% in 2015. So even if this wasn’t a snap election, it would be safe to assume that turnout is likely to continue to fall. But what is the impact of calling elections earlier than expected? To answer this question we need to first take into account the fact that turnout is falling by subtracting the downward trend seen in the chart above. Our analysis is more difficult due to the low number of ‘snap’ elections since 1945. Of the 18 elections since then, 15 have been called after either 4 or 5 years and thus only 3 elections can truly be called snap elections. In 1974 (1 in the charts above) there was almost certainly some voter fatigue with 2 elections called in the same year. In that year turnout dropped from 78.8% to 72.8%. In 1951 (2 in the charts above) turnout fell slightly but not by as much as it would have been expected to according to the overall decreasing trend in turnout. It is shown in this graph as being almost 3% higher than the trend. 1966 (3 in the charts above) also saw a snap election but in this case the turnout was similar to what would been expected by the trend, and the voters did not punish Wilson for calling an early election. Although there is a spread for elections that were called 4 and 5 years after the previous election, the spread is higher for those elections that were called after 5 years than those called after 4 years. The reason for this could be that the electorate are more energised with a desire to remove a government that has clung onto power for an extra year. If excitement of the electorate is a factor, then should this not also show in close elections – where there is really something at stake? 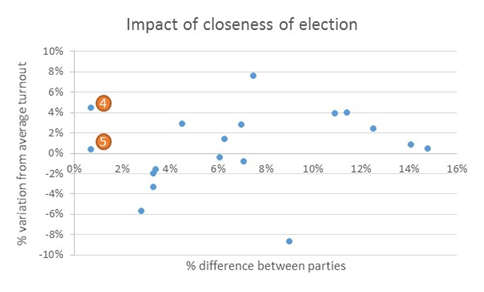 What is the impact of close elections? There is no clear pattern that emerges from this chart. The first election in 1974 (4 above) was the closest since the war where only 0.7% separated the top 2 parties. This did produce an increase of over 4% in the turnout. However, the next closest election, in 1964 (5 above), saw a turnout very similar to what would have been expected. Of course, there is often a difference between the way an election turns out and the expectation of the election beforehand. If we look at the opinion polls just before the election, we may see more of an impact. In 2015 the opinion polls suggested the difference between the top parties would be 1.3%, and this led to a turnout that was slightly higher than expected. In 2010, 2005 and 2001 the expected difference between the parties was much higher, and the turnout was consequently lower. This relationship was best shown by the 2001 election where the turnout was almost 9% lower than expected. There is a popular hypothesis that elections are better in certain months. Who wants to come out to vote on a cold wet night? In addition, the lead up to the election sees many parties employ workers to knock on doors. In my experience, there is not much desire to do this whilst the clocks are not on British Summer Time. The actual results do not fit this hypothesis – although April and February are supposedly colder and wetter months, they saw a higher turnout (albeit with not many examples since 1945). However June, which should be ideal voting weather, saw an unexpectedly low turnout. Perhaps people are more interested in summer activities than voting? So what do we think the turnout will be? If we follow the trend since 1945, the turnout should be around 64%. 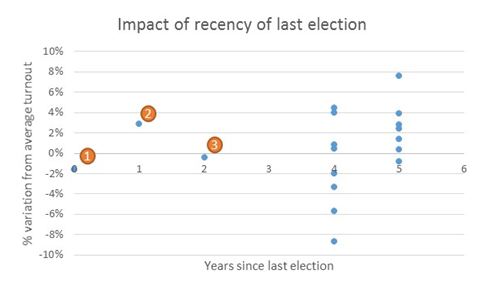 The fact that it is only 2 years since the last general election should not have much of an impact on the turnout this time round – although this does not take into account any other elections (e.g. last years referendum). How many seats are ‘winnable’ in the General Election?